Cisco today entered the physical security information management (PSIM) market by introducing its Physical Security Operations Manager (PSOM). The system (click on screen shot at right to enlarge) ties together Cisco's video surveillance, access control and incident response systems, providing operators a comprehensive incident view at one console, according to Steve Collen, director of marketing for Cisco's physical security business unit, who spoke with Security Squared in a pre-announcement interview last week. "For the first time, we have a product that integrates everything that we're doing in the physical security space," said Collen. "This is clearly what our customers want. They are typically deploying more than one technology from us and said they want an interface that integrates everything." 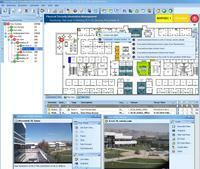 Cisco's partner list includes key PSIM and public safety players like Proximex, VidSys and Intergraph. However, Collen claimed Cisco's PSOM is designed to integrate primarily Cisco components, not a PSIM system's typical array of third party systems, apps and sensors. "[PSOM is] not competitive in the sense that those products are typically oriented to particular verticals, and they are also able to integrate lots of third party systems, not just Cisco," said Collen. "What we are offering is for integrating Cisco products. We've had discussions with many of our partners. We have articulated our position to them, and they are comfortable with it." That said, Cisco is positioning all of its ASIS announcements at ASIS as key to its Smart+Connected Communities initiative. The ambitious program incorporates many Cisco products and services targeted across city agencies, including some that PSIM vendors typically approach. Entering another level of the PSIM market, Cisco is introducing a system specifically designed for educational institutions. "This is a single user interface for the education market through a partnership with Vision Security Software," said Collen. Vision Security offers IVS, described on the company's web site as a "video security product" with "unified GUIs" with mapping functions and "dynamic integration" with a range of other systems, from alerts and intrusion detection to facilities management systems. Collen noted Vision is especially strong in the K-12 education market and enables schools significant degrees of customization in their interfaces, such as linking to school events or contact names. "We have a lot of K-12 customers, so it made sense to work with Vision to come up with a really good user interface," he said. "That's like a PSIM-lite for education. The schools don't need the sophistication of a PSOM system or PSIM system. They want a single way of handling their video so that a school principal could handle it with very little training." In the education market, Collen does expect Cisco's new platform to run up against video management system vendors, including some who have been openly marketing their platforms as "PSIM lite." "If it's a competitive situation and we're up against OnSSI or Milestone or Verint or others like those, we definitely think having this education-flavored, simple-to-use interface is going to give us a competitive edge," he said. "The customer doesn't want to learn all the ins and outs of configuring a video surveillance system. They just want a very, very easy interface to use." Cisco also is today announcing a line of "medianet-enabled" H.264 cameras. "Medianet" generally refers to a network optimized for handling rich media; Cisco has embraced the concept across product lines, said Collen. When the company's new medianet-ready cameras are plugged into a Cisco Ethernet switch, intelligence on the cameras and within the switches will automatically configure the cameras and network, he said. "Imagine you're a system integrator or customer. You plug in a camera, you don't have to configure anything. It simply runs itself. This is a big deal," said Collen. He did note both Cisco cameras and switches are required for the auto configuration. "With our market share, there's a very high likelihood that switch will be from Cisco," said Cullen. The new model 4500 HD cameras have built-in analytics for security or people counting purposes. Collen said at least one large do-it-yourself chain is using the cameras in its bath and kitchen center. When the "dwell time" within the defined area reaches a certain length, a store associate receives a message to wait on the customer. "That tends to improve the ROI of the surveillance deployments and the store in general," Collen said. He said Cisco developed some of the cameras on its own and others with its technology partner Pelco. "We have the strategic technology agreement going on with Pelco in the background," said Collen. "That's working out really, really well. Pelco continues to be really strategic for us." Tune in again Thursday, when Cisco will disclose more about how these products all combine to create urban security solutions.